Gallia Academy senior Cole Davis (1) drives in for a layup after picking off a pass, during the Blue Devils’ double-overtime setback on Friday in Centenary, Ohio. CENTENARY, Ohio — About as close as a sweep can get. 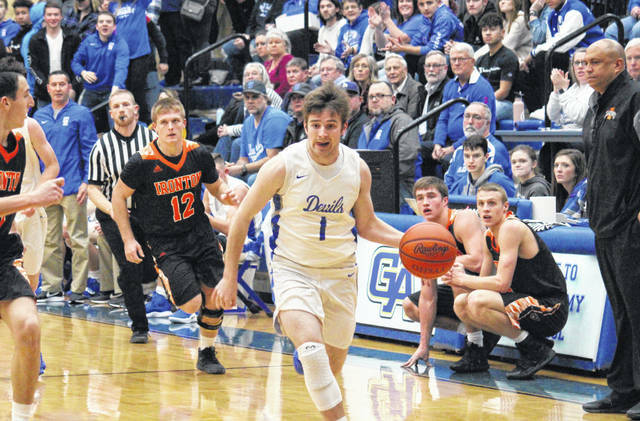 The Gallia Academy boys basketball team — which fell by a 59-57 tally on Dec. 14 at Ironton — took the same Fighting Tigers to double-overtime in Ohio Valley Conference action on Friday, but the Orange and Black escaped Gallia County with a 63-55 victory. Ironton (12-4, 6-3 OVC) led initially and got out to game-high 11-point lead, at 15-4, six minutes into play. The Blue Devils (9-5, 6-3) scored the final three points of the first quarter and the first eight in the second, tying the game at 15 with 4:30 left in the half. GAHS led for the first time at 22-20 with 3:08 remaining in the period, but the Fighting Tigers regained the edge with a 5-to-1 spurt, consisting entirely of free throws. The Blue and White answered with a 5-to-2 run and headed into the break with a 28-27 edge. Ironton scored the first nine points of the second half and led 36-28 by the 4:50 mark of the third period. The IHS lead was never larger than eight in the quarter, and the guests settled for a 43-37 lead headed into the fourth. 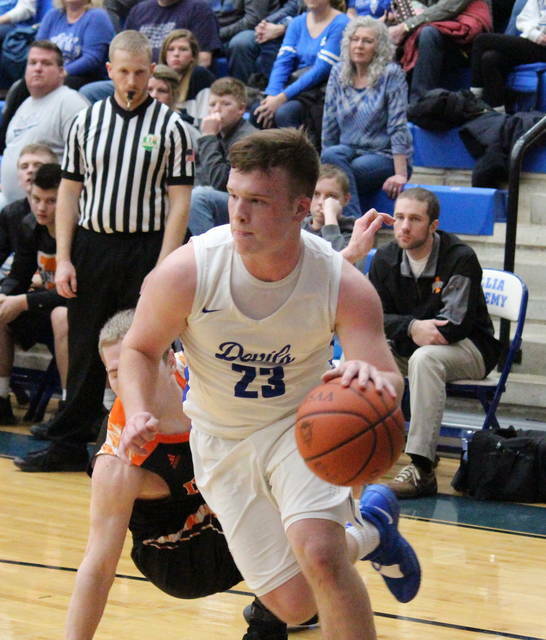 The Blue Devil defense held Ironton to just two points in the first six minutes of the fourth quarter, and the hosts regained the lead, at 47-45, with a Justin McClelland trifecta with 1:56 left in regulation. The guests tied the game 19 seconds later and the teams headed for overtime tied at 47. The first 2:40 of overtime was scoreless, before McClelland hit a three-pointer on an assist from Cory Call with 1:19 left. Next, IHS cut the Blue Devil lead to one point with back-to-back free throws with 56 seconds to go. Gallia Academy then went 1-of-4 from the line and led by two, but Ironton’s Charlie Large made a two-pointer with 10 seconds left to force a second overtime. The Blue and White surrendered the first 10 points in the second OT, eight of which came from the free throw line. McClelland made a four-point play with 10 seconds left, but then the Fighting Tigers made a pair of free throws to seal the 63-55 victory. Following the setback, GAHS head coach Gary Harrison gave credit to the Fighting Tigers and acknowledged his squad’s trouble at the foul line. “It was a great game,” Harrison said. “Ironton’s good, it was a two-point game the last time we played, and it could have went to overtime. They did a nice job of being physical. What got us is free throws. We made one of our last five free throws in regulation and the first overtime, that beat us. If we make free throws, we win. 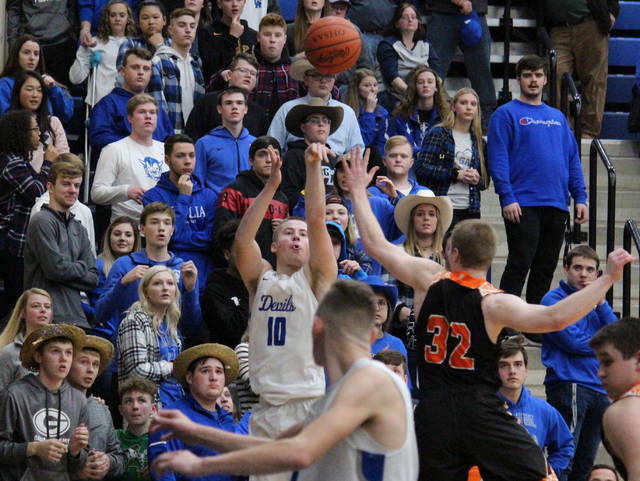 The Blue Devils made 18-of-54 (33.3 percent) field goal attempts, including 5-of-22 (22.7 percent) three-point tries, while Ironton was 19-of-40 (47.5 percent) from the field, including 4-of-8 (50 percent) from beyond the arc. At the charity stripe, GAHS was 14-of-24 (58.3 percent), while IHS was 21-of-31 (67.7 percent). The Orange and Black won the rebounding battle by a 35-to-20 count, including 10-to-4 on the offensive end, but IHS committed 18 turnovers, twice as many as the Blue Devils. 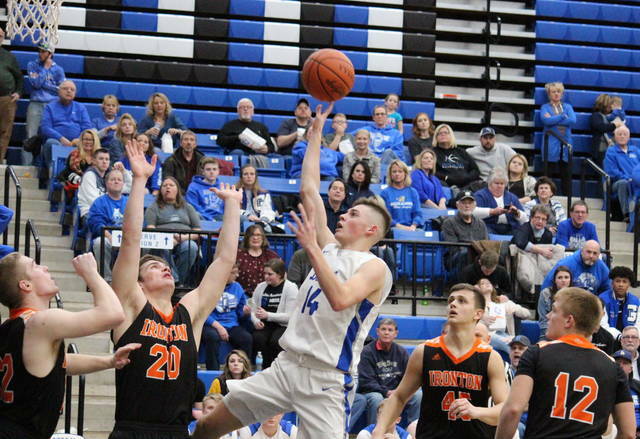 Collectively, the hosts earned 10 assists, 10 steals and a trio of blocked shots, while Ironton totalled 13 assists, two steals and one rejection. McClelland led the Gallia Academy offense, dishing out four assists and scoring 21 points on four three-pointers and a 9-of-11 performance at the free throw line. Caleb Henry tallied 11 points in the setback, while Logan Blouir recorded 10 points, five rebounds and four assists. Cole Davis contributed five points to the GAHS cause, Bailey Walker chipped in with four points and five boards, while Ben Cox and Blaine Carter came up with two points each. Leading the Blue Devil defense, Henry earned three steals and a block, while Call had two steals and two blocks. Large led Ironton with 19 points, 10 of which came in overtime. Reid Carrico had a double-double of 18 points and 10 rebounds for the guests, while Ethan Wilson tallied 11 points and nine assists. Jordan Grizzle scored eight points, Trent Milleson and Collin Freeman chipped in with three each, while Erickson Barnes marked one for the victors. After hosting Warren on Saturday, GAHS will get back to work in the OVC at home on Tuesday against Coal Grove.